The events of the last week have generated tons of interest in meteors and the equipment used to record and plot their tracks across the sky. I've received many questions about how and why I set up my allsky camera and the accompanying equipment to monitor meteors. In this post I hope to give you a tour of my setup and answer some of the questions I've been asked about how ans why I do what I do. Put simply, I really love the thrill of discovery! I enjoy being able to provide information to researchers and scientists around the world. I'm not a scientist myself but I am a science enthusiast. 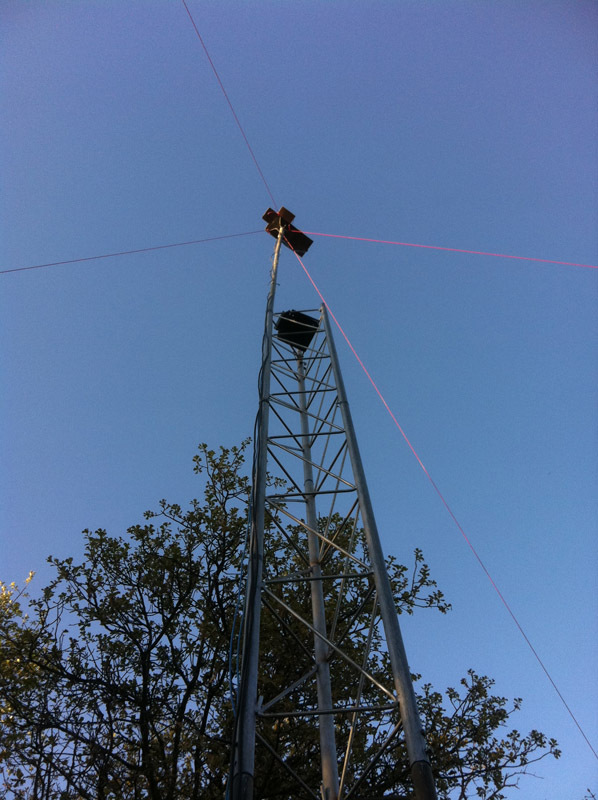 My allsky cameras are my attempt to be part of something bigger in the world of science. I guess I'm an armchair scientist. I compare my meteor cameras to fishing. I set them up, sit back and relax and wait for a bite! Each morning I check the cameras to see if I caught anything good the previous night. I also have a network of friends who do this very same thing! We email each other if we get a big "hit" on one of our cameras and we all rush to see if we caught something too! We all share a love of discovering something most people only occasionally think about. Meteors! The Main Science camera is a Sandia Allsky Camera. The Sandia allsky network is a group of allsky cameras from Sandia National Laboratory in New Mexico. Since I'm almost in the middle of Texas and live in a nice dark area they asked if I'd be willing to host a camera for them. 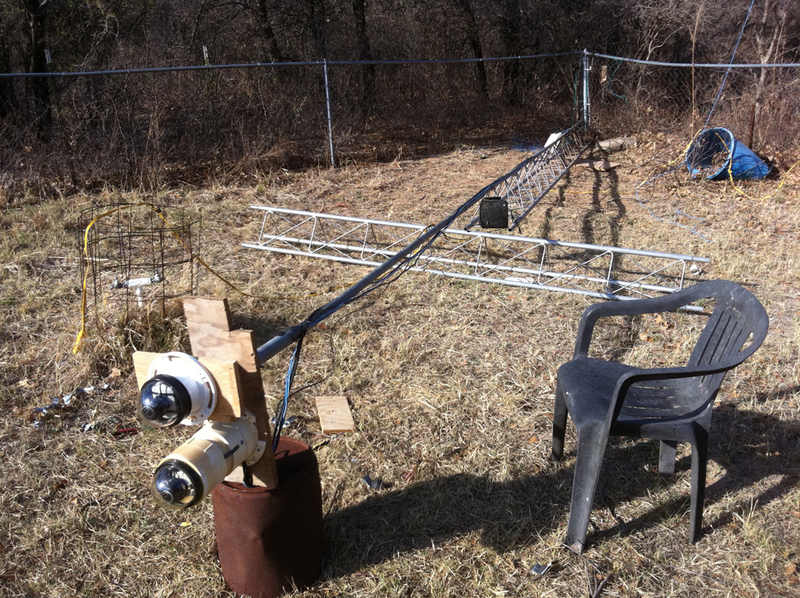 This is how I got my start into the world of meteor monitoring! The allsky camera itself is a black and white low light CCD video camera. the camera has a fisheye lens installed that allows a 180 degree view of the sky. Horizon to horizon. 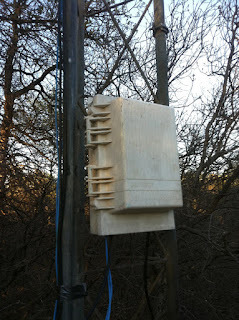 I built a platform for the Sandia Camera. 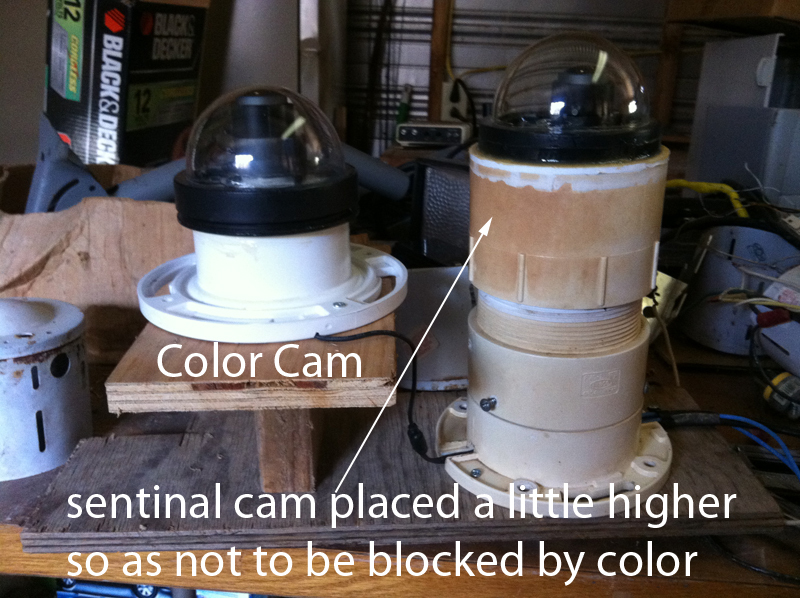 I then added a secondary color camera of my own. 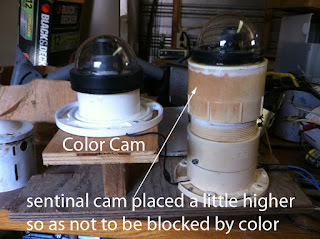 using the sandia camera as a model I built a housing for my color camera. All the parts are constructed of PVC plumbing. The dome on my color camera is just a Dummy Security camera dome purchased from Harbor Freight and waterproofed with silicon sealant. 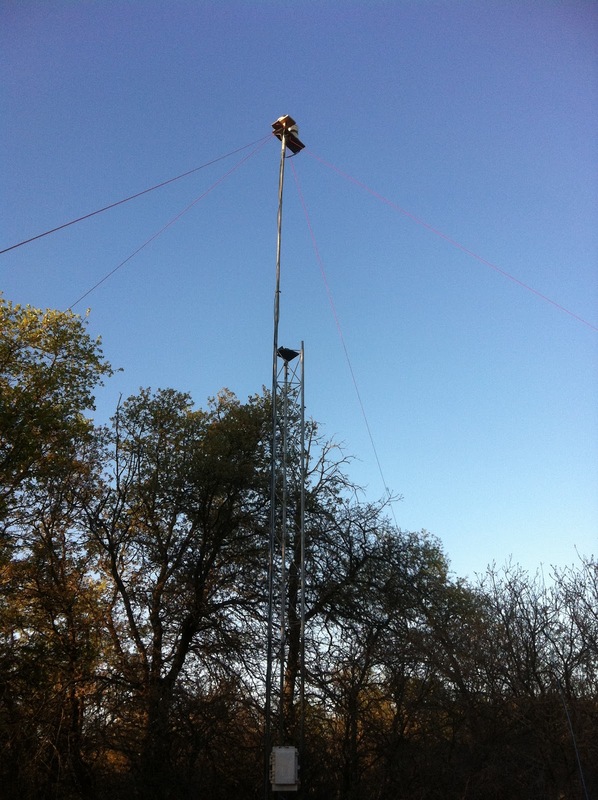 Since I'm in the middle of some trees where I live I decided early on to place the cameras on a 30 pole to get them up high enough to see the horizon. 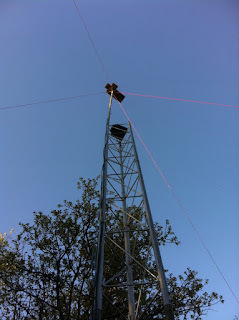 I used an old dish network dish mount to bolt the camera platform to. 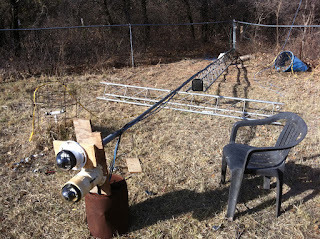 I cut off the bend in the dish mount's pole so it could be placed over a tower segment leg. 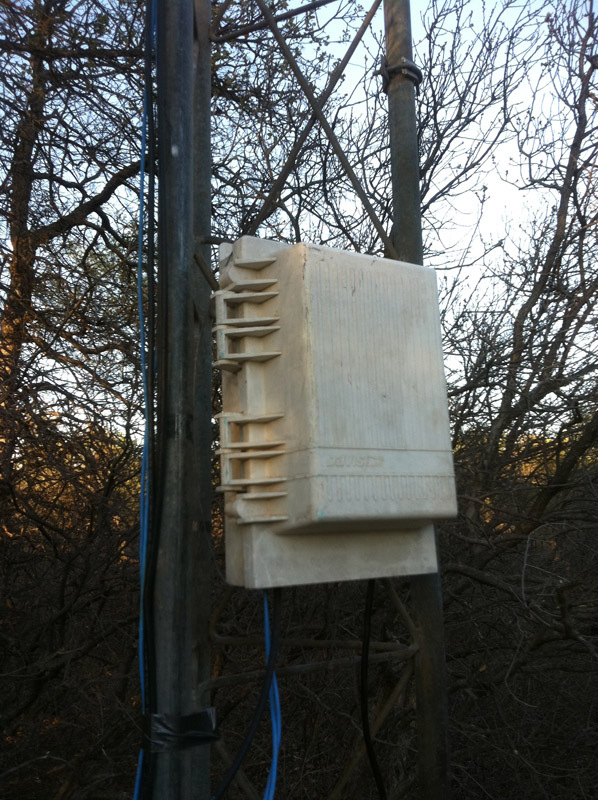 I ran power and video down from the platform to a weatherproof housing to make the connections accessible from ground level. The entire thing was raised and secured with guywires to keep the platform stable in the wind. 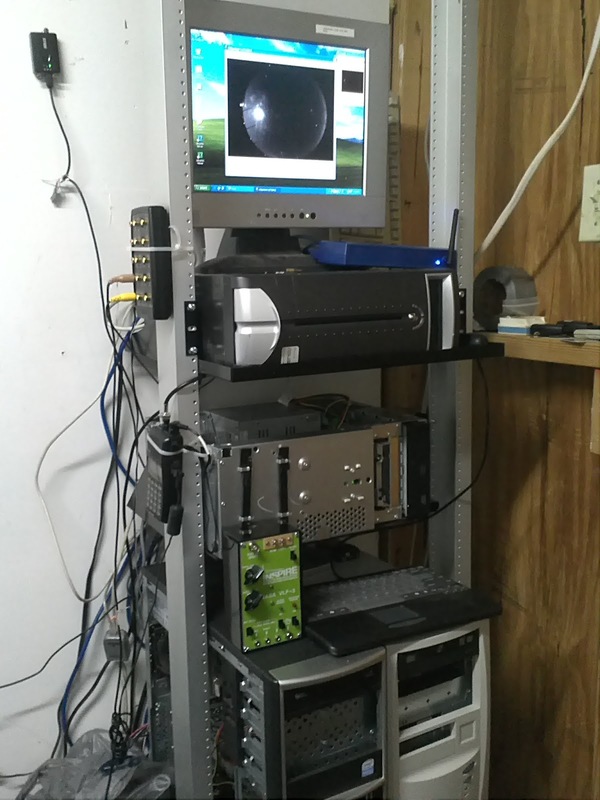 The video lines run into a "computer shack" that houses the meteor detection and forward scatter radar audio monitoring software. The software watches the video from each camera and if it senses any motion or change in brightness it records the event to a hard drive. 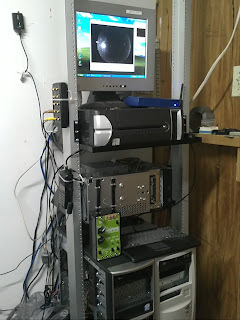 This is the rack of equipment that monitors all the video and audio feeds. It's not pretty but it gets the job done! I have several processes set up to automatically feed images and updates to the web for this blog. One feeds what the allsky camera sees and overlays a starchart. That image is then displayed with a flash displayer I created for the blog. It's the top left blue backgrounded image on this page. meteor has been picked up by radar reflection. The forward scatter radar uses a radio to detect radio reflections off a meteor and it's trail of ionized gas as it passes through the atmosphere. Here's a link to a detailed description of the process. This image is also uploaded and displayed with a flash displayer right under the allsky image in the upper left of this blog. I hope this provides a reasonable explanation to all those who were curious.